A breakthrough in my art process. I have been spontaneously sounding to each layer of a new mixed media art piece where I find myself exploring edges and borders and their co-mingling sites of encounter. My visual art process is one of sewing on canvas, paint staining the canvas, paper collage, draw, collage, draw and so on. I have added to the mix vocal, rubbing and percussive sounds-- performing a response to each layer of the art piece. The sound drawing below consists of seven overlapping layers/track of each sounding that was sent into the art piece. I am now seeing the art piece as a contemporary oracle hole. The, finished for now, mixed media drawing on canvas and paper is to the left. The collaborative sounding work that I have engaged within the Gestare Art Collective and with my friend and collaborator Tannis Hugill has now filtered its way into my own art practice. The three diptyches below are oil pastel on paper. They are very physical as I worked with a heavy hand in each. Each began with a mail-in order card from an art magazine. 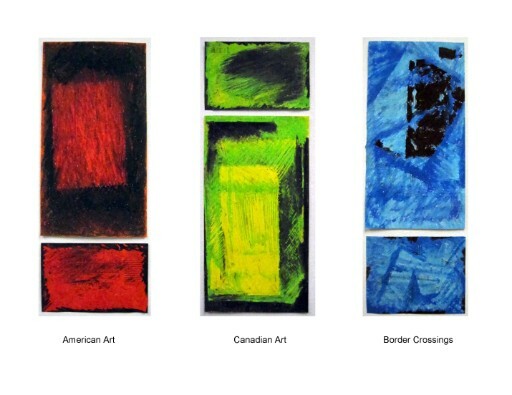 This series will continue as I work to locate myself as a dual citizen artist--a Canadian living in America. Having recently become American I find myself with double responsibility. I feel the gravity of being an American/Canadian at this time in history. Working with edges and borders is a theme that keeps emerging. I recently read of the possibility of becoming a world citizen - transcending nationality and living as a human supporting human rights on the planet earth (see http://www.worldservice.org/docpapp.html). This appeals to me as my life experience has been one of never feeling permanent but always in a state of change and movement. These inner edges that have been emerging visually are satisfying and resemble the oracle hole found in the hypogeum in Malta. I have begun sounding into them. The sound drawing below is a layered arrangement of five sound drawings in response to the five art pieces I have done so far in the series. The first three visual art pieces are viewable below. I am more lucid in your space than in my own. I am the joyful scribe, paper and pencil ready. Around us: a generous white emptiness. a blank gauntlet pinned to the wall. walk across the room, back again. You take a sip of ginger tea. that my pencil needs sharpening. birthing colour into the void. Green, blues, the lake lives water. Barbara & Patricia Sereno in a studio/harp performance together in July 2010 at Artscape gibraltar Point.